LONDON | While the European Central Bank and the Spanish government argued on Wednesday about the best mechanism to salvage Bankia, Caroline Keen, a member of the team managing the Newton Asian income fund at investment house BNY Mellon, said euro crisis contagion was rapidly developing elsewhere, too. 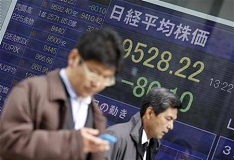 Keen warned that economic headwinds from the euro zone were likely to affect the Asia-Pacific ex Japan region for the remainder of 2012. At the start of 2012, BNY Mellon identified as key risks for Asia-Pacific market the sovereign debt crisis in Europe, a possible oil price spike given tensions in the Middle East, and the potential ramifications of an economic slowdown in China. The oil price has come off its recent highs of US$125/barrel, which is a relief for the importing countries in Asia like Thailand and India. As for China, the company noted that the country is currently seeing the economy enter a transitional phase, from a high growth investment-led model, to a more sustainable consumption-based one. As this occurs, economic growth is expected to slow and we are watching carefully for signs of this. “In Europe, events have clearly been negative for Asia, both in terms of sentiment and because Europe remains Asia’s largest trading partner,” Keen said. “The good news is the global economy probably is better positioned for a Greek exit from the euro than it has been in at any time in the last two years. Be the first to comment on "The euro contagion reaches Asia"